Can I Have My Money Back? 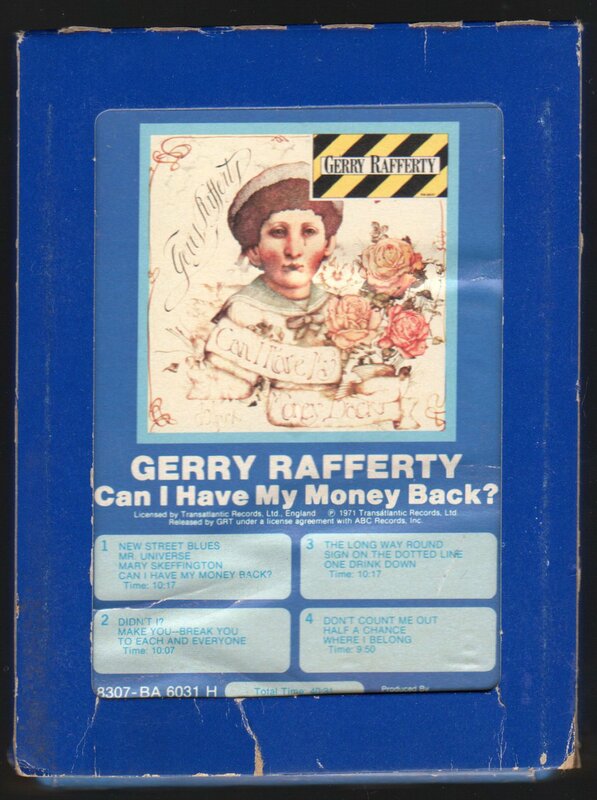 is the first solo album by Gerry Rafferty. The distinctive cover design was by John Patrick Byrne and was the start of a long working relationship between Rafferty and the playwright. The LP was well received, but performed poorly in charts and sales, in part because Rafferty had just left a well known band, The Humblebums. The album also saw Joe Egan come on board, and the pair formed Stealers Wheel shortly afterwards. Gerald "Gerry" Rafferty (16 April 1947 – 4 January 2011) was a Scottish singer-songwriter best known for his solo hits "Baker Street", "Right Down the Line" and "Night Owl", as well as "Stuck in the Middle with You" recorded with the band Stealers Wheel. Rafferty was born into a working-class family in Paisley, Renfrewshire, Scotland. His mother taught him both Irish and Scottish folk songs as a boy; later, he was influenced by the music of The Beatles and Bob Dylan. He joined the folk-pop group The Humblebums in 1969. After they disbanded in 1971, he recorded his first solo album, Can I Have My Money Back? Rafferty and Joe Egan formed the group Stealers Wheel in 1972, producing several hits, most notably "Stuck in the Middle with You" and "Star". In 1978, he recorded his second solo album, City to City, which included "Baker Street", his most popular song.